The gaming community has a seemingly insatiable appetite for games that remind players of yesteryear, and Tower 57 is just one of the latest attempting to make its mark. 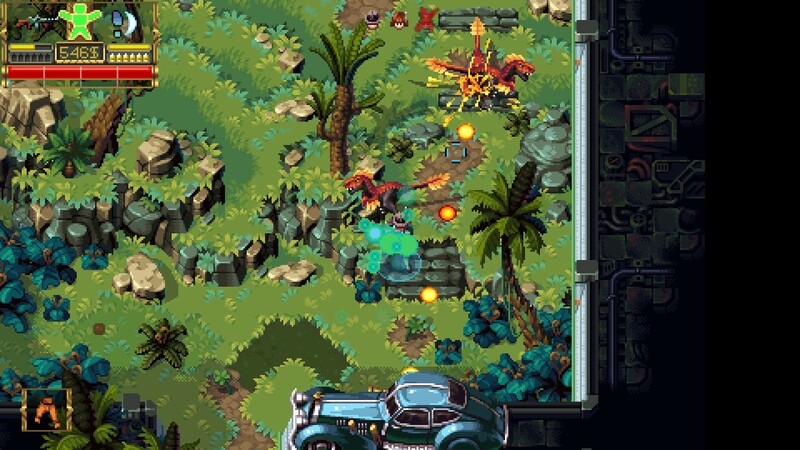 This release is a top-down, twin-stick shooter set in a dieselpunk world, born of a successful Kickstarter project launched in August 2015. It’s the first game from two-man studio Pixwerk, heavily inspired by the 16-bit games of the Amiga personal computer (released in 1985)—so much so that they’re actually making an Amiga port of Tower 57 as a Kickstarter backer reward. In the world of the game, society is relegated to living in massive vertical towers. It’s your job to form a team of three from a cast of six characters, each with their own special ability and starting weapon, and to infiltrate the upper levels of Tower 57, putting an end to the nefarious forces at work. As you might guess, things don’t quite go as planned. The story is told through short in-game dialogues and through emails and news items found on terminals. No heavy exposition here—Tower 57’s main focus is getting you into the fray as fast as possible. 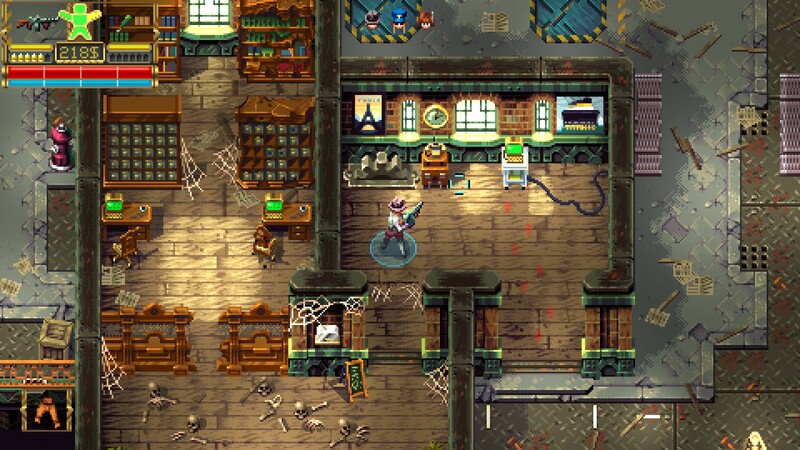 The 16-bit environments of Tower 57 are absolutely gorgeous, full of vibrancy and color. Pixwerk takes the old-school graphics into the modern era, adding in destructible environments: lights break and go dim, pillars crumble, and tables splinter as you fight your way through rooms. Each level, though mainly linear, is well crafted, offering a handful of its own secrets to discover. From grimy sewers to upscale apartments, the design of each one shines. Tower 57’s synth soundtrack is an excellent companion, matching the 16-bit graphics and the mood of an 1980s action flick. Each level feels well designed and functional. The downsides: enemy variety is a bit of a letdown, the diversity in unique enemies in each level is a bit lacking, and common enemies are often repeated throughout every level. There is, at least, a good variety of weapons in the game. However, you’re limited to carrying only two weapons at a time, and you’ll likely be carrying upgraded weapons, giving you little incentive to pick up a new and untested (and potentially weaker) weapon. Similarly, there’s a variety of secondary items, though there’s no indication of what they do, so it’s a process of trial and error, picking them up for potential misuse later in battle. Each character has a unique ability, such as the Don’s drive-by. Tower 57’s difficulty is particularly high, even on the lowest setting. Hits from enemies take off a good chunk of health, and when one of your characters are dies, they’re dead until you can find a certain (fairly rare) item to resurrect them. Boss battles can be absolutely brutal, especially when you’re down to one or two characters, and it’s not uncommon for them to have one- or two-hit-kill attacks. This become particularly frustrating with the game’s somewhat common bug of getting stuck on the environment, which spells certain doom in a boss arena. As of this writing, the development team is continuing to release patches to fix bugs, alter encounter difficulty, and tweak room layouts. Pixwerk should be commended for the addition of local co-op multiplayer, a rarity for PC games in 2017. If you have an Xbox or PlayStation controller, you can hook it up and play though the game with another person on the same screen; online co-op is also an option, if you’re feeling particularly modern. Tower 57 is currently only available on PC, though Pixwerk plans to bring the game to Xbox One and PS4 in 2018. Despite its rough spots, Tower 57 is an enjoyable twin-stick shooter that’s done a good job of standing out of from the numerous other old-school games on the market and should be on the radar on anyone who is a fan of the genre. It is available on Steam and GOG.